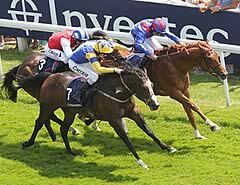 Following its successful deployment at the climax of last year’s inaugural QIPCO British Champions Series, QIPCO British Champions Day at Ascot, sectional timing from TurfTrax is to be rolled out across almost two-thirds of the 35 Series races in 2012. This is a joint deal between the QIPCO British Champions Series and the four individual racecourses involved – Newmarket, Ascot, Goodwood and York. In total 19 racedays will be covered, including the whole of four iconic racing festivals - the QIPCO Guineas Festival at Newmarket, Royal Ascot, Glorious Goodwood and the Welcome to Yorkshire Ebor Festival at York – as well as Betfair King George Day at Ascot. Every race will be covered on the participating racedays, which comprise 16 QIPCO British Champions Series fixtures and three days which do not feature a Series race - Dubai Future Champions Day at Newmarket, when many of the stars of next year’s Series are likely to be in action, and days one and four of Glorious Goodwood. Discussions are due to start soon with the host broadcasters to help them achieve maximum benefit from the data with which they will be provided. Rod Street, Chief Executive of the QIPCO British Champions Series, said: “We are delighted to be bringing sectional timing to over 60% of our Series races this year in partnership with Ascot, Goodwood, Newmarket and York. “As well as providing invaluable data to enrich broadcasts and post-race reporting, we hope that it will prove another step along the road towards even more extensive use of this excellent TurfTrax product in the future. Michael Prosser, Director of Racing at Newmarket Racecourses, said: "We are great advocates of sectional timing, having trialled and subsequently utilised the TurfTrax system on the Rowley Mile racecourse in the past. "We are delighted that sectional timing will be in place for the QIPCO Guineas Festival and believe that it will especially add to the post-race analysis of the QIPCO 2000 and 1000 Guineas - the prestigious Classics which will launch the 2012 QIPCO British Champions Series. We are also looking forward to having the TurfTrax system at Dubai Future Champions Day." Mike Maher, Managing Director of TurfTrax, said: “We are delighted that the QIPCO British Champions Series has been able to extend so significantly the number of races covered this year following the successful deployment of the TurfTrax Tracking System on QIPCO British Champions Day at Ascot last October.